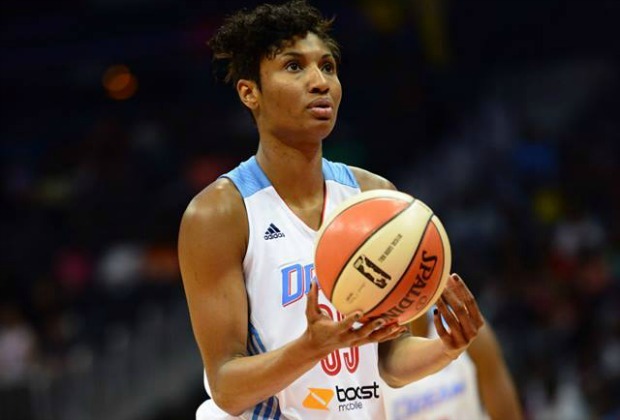 The Atlanta Dream gave their home crowd who came out to celebrate Carribean Heritage night and to see the last home game of the season a little more to celebrate when they beat the visiting Tulsa Shock in a 92-76 win on Friday. Erika DeSouza lead the Dream with a double-double scoring 21 points, 12 rebounds, and 2 blocks. In the first quarter, both teams came out with great momentun and fast pace with Tulsa putting the first two points on the board. As the Dream got into their rhythm in joining the Shock in scoring, both DeSouza and Hayes got into early foul trouble by landing two a piece. It didn’t seem to effect anything because both teams remained to run the floor making it a game of tug of war by tying the score three times and having the game’s only five lead changes. At the end of this hard-fought quarter, the Atlanta Dream prevailed leading Tulsa by four with the help of Sancho Lyttle’s eight points. Making it a score of 23-19. In the second quarter the Dream came out still ready to play, and their defense told it all. After Tulsa was able to score another bucket, Atlanta held them at 21 points for the next five minutes while breezing past them in scoring another 24 points making it 47-25 going into halftime. Whatever their plan was to stop Tulsa point guard Skylar Diggins, it worked because she was scoreless in the first half. Coming into the third, both teams must have had some great pep talks because there for a moment, it was starting to look something like the first quarter. Diggins finally scored for Tulsa giving the Shock a boost from halftime’s 22-point deficit. Just when it seemed that the Shock were going to have a chance to get back into the game, Atlanta dominated again by grabbing offensive rebounds, forcing turnovers and showing off a few of their fancy moves to go into the fourth with a 26-point lead. The fourth quarter of course didn’t change that much at all. Although the Shock outscored the Dream, they still wasn’t able to pull off the win. Atlanta’s record is now 19-14 going into Sunday’s game against Kelsey Griffin and the Connecticut Sun.